Learn and gain knowledge and wisdom in your youth. And lift and strengthen those around you. We all start with basic intelligence. We add knowledge to that with the learning that comes through the classroom and reading. We add life’s experiences. And then we get to the fourth step: wisdom. That’s where the world stops. But we have something the world does not have. Upon baptism and confirmation, we were given the gift of the Holy Ghost. Based on our faithfulness to the laws, ordinances, and covenants we take upon ourselves at baptism, to regular and frequent sacrament meeting commitments, and to priesthood and temple covenants, we will always have the gift of the Holy Ghost to teach and direct us. The Spirit leads us to act and to do. We all have spiritual gifts and talents (see D&C 46). Wisdom plus spiritual gifts lead to an understanding in the heart. “Wisdom is the principal thing; therefore get wisdom: and with all thy getting get understanding” (Proverbs 4:7). It is important to cultivate wisdom and understanding in your youth. An experience from my youth taught me something about wisdom. I was a city boy, so my father sent me to work on my uncle’s ranch in western Utah. While I was there, I never could understand why the cattle, with thousands of acres to choose from, would put their heads through the barbed wire to eat the grass on the other side of the fence. Have you ever thought about how much we’re like that? We will always push to see what the outer limits are, especially in our youth. As human beings﻿—the natural man﻿—we tend to push up to the barbed wire and stick our head through it. Why do we do that? We can have so much joy in life without pushing the limits. Remember, “wisdom is the principal thing,” and with that wisdom, “enter not into the path of the wicked, and go not in the way of evil men. Avoid it, pass not by it, turn from it, and pass away” (Proverbs 4:14–15). Don’t come close. Don’t put your head through the barbed-wire fence. You will notice that, along with these teachings on wisdom, the book of Proverbs also teaches about choosing good friends: “Enter not into the path of the wicked, and go not in the way of evil men” (Proverbs 4:14). “My son, walk not thou in the way with them; refrain thy foot from their path: for their feet run to evil” (Proverbs 1:15–16). How do you know if you have good friends? I will give you two tests. If you apply these tests, you will never go into strange paths and wander off the “strait and narrow path which leads to eternal life” (2 Nephi 31:18). 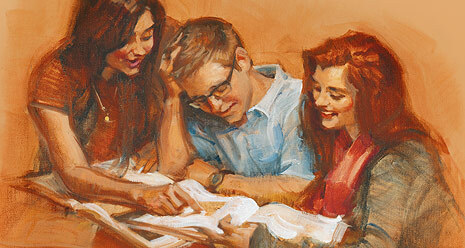 Good friends make it easy to live the commandments when you are with them. A true friend strengthens you and helps you live the gospel principles that will assist you to endure to the end. A true friend will not make you choose between his or her ways and the ways of the Lord, thus taking you off the strait and narrow path. The adversary roams this earth and wants so much to have each one of us fall. If your friends are taking you on paths of wickedness, depart from them now. Choose your friends wisely. Now I ask a difficult question: what kind of friend are you? There is more to life than saving ourselves. We are commissioned to lift and to strengthen all those around us. The Lord wants us all back to Him together. You are a lighthouse, and there is nothing more dangerous than a fallen lighthouse. Remember who you are: you are a light to the world, to your friends, to your brothers and sisters. You are who they look to. “But the path of the just is as the shining light, that shineth more and more unto the perfect day. “The way of the wicked is as darkness: they know not at what they stumble” (verses 18–19). They really don’t know why they’re stumbling. They have no light, no direction. Do you know what it is like to depend on a lighthouse when the light is not there? Darkness results, and we are lost. When a pilot loses electrical power, he has no indicators except those things that work without electricity. He feels totally helpless when he is in a single-seated fighter 40,000 feet (12,200 m) in the air being buffeted around by clouds and such. He doesn’t have any direction. I came through an experience like that, and I’m glad I’m here. It’s an experience that I will never forget. You too may someday find yourself in such a position. There is nothing as dangerous as a fallen lighthouse, especially when you’re depending on the light. Is someone depending on your light to guide him or her? Be a good example. Be a light to the world and lead and guide those around you in paths of righteousness. They are depending on you as a faithful lighthouse. Be there when someone needs you. The Spirit is the guiding light that brings joy and happiness. May we never be denied the Spirit to be with us because of our conduct. Oh, how I pray that we will never be alone and sad in this “dark and dreary” world (1 Nephi 8:4). May the Lord’s blessings be with you as you strive to learn and gain knowledge and wisdom in your youth. May you also gain wisdom and understanding in your hearts of the gospel truths by obedience and also by the light of the Spirit, the Holy Ghost. Be a good friend. Lift and strengthen those around you. Make the world a better place because you were here. Help your friends stay on the strait and narrow path, endure to the end, and return with honor. Be a light to the world and lead and guide those around you in paths of righteousness. They are depending on you as a faithful lighthouse.